Atkins™ Nutritionals, Inc. manufactures and sells a variety of nutrition bars, shakes and other low-carbohydrate foods designed in compliance with the nutritional principles of the Atkins Diet. The Atkins Nutritional Approach™, is composed of four phases: Induction, Ongoing Weight Loss (OWL), Pre-Maintenance and Lifetime Maintenance. Most individuals can decide—based upon their needs and preferences—in which of the first three phases to start, enabling them to find their personal tolerance for carbohydrate intake while losing or maintaining weight. I was very impressed with how good these bars were -- I honestly forgot that they were nutritional bars because they tasted like granola bars or snack bars! 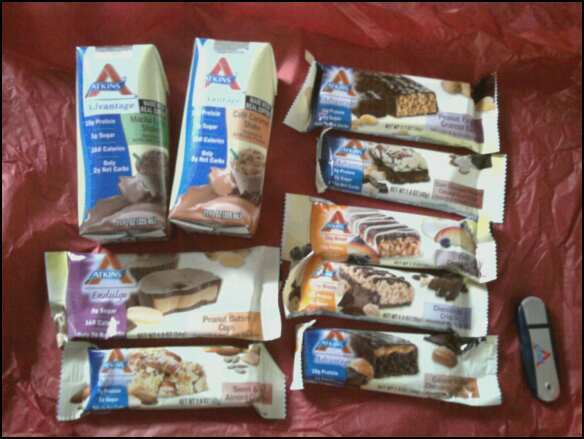 My favorite was the Peanut Butter Fudge granola bar in the Advantage line. It was amazing! I was also very impressed with the new flavors such as the Caramel Chocolate Nut Roll and the Sweet & Salty Almond Crunch Bar - the mix of sweet and salty really satisfied my cravings. And the Peanut Butter Cups from the Endulge category actually tasted like regular peanut butter cups - I was surprised because I didn't think they would compare to the real thing. The one bar I didn't care for was the Fruit Crumble Daybreak bar, I didn't like the texture and the taste didn't compare with the other bars. But I was more than impressed with these Atkins Nutritional Bars and not only are they great if you're going the Atkins route, but they also are nutritious whether you just want a low sugar snack or even on the Weight Watchers program, I calculated the bars to be either 2 or 3 points each, so they can work for many different programs. It's nice to have "diet" bars that aren't loaded with sugar and carbs. That's why I feel like these bars could be part of any diet, whether you are sticking to the Atkins program or just doing your own thing. Disclaimer: I was given Atkins Nutritionals bars and shakes free of charge for the purpose of this review. All opinions are my own experiences with the product. Individual results may vary. No other compensation was given.